Stowe Cider has announced the release of Apple Haze, a new, unfiltered, hazy cider made with fresh-pressed apples. 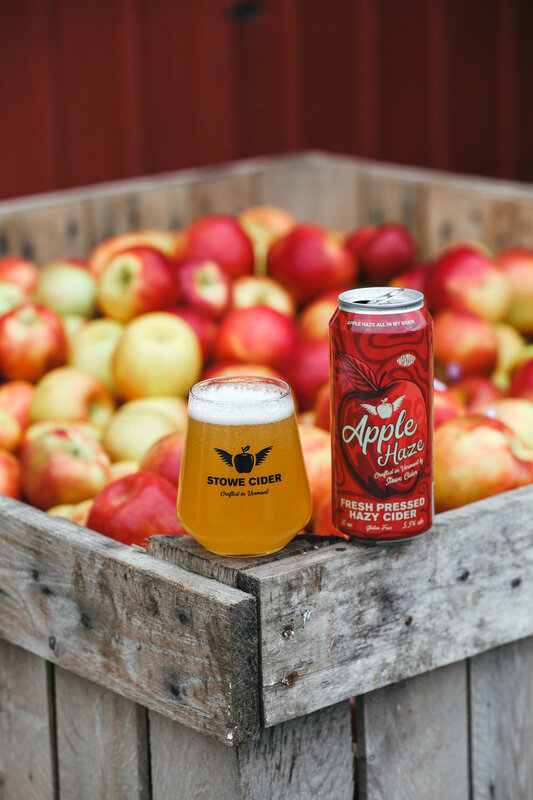 Apple Haze will join Stowe Cider’s other headliner ciders as a year-round offering, making sure cider drinkers can get their fill in any season. Apple Haze’s characteristics make for a slightly opaque pour and a beautiful solid gold color. Landing smack in the middle of the sweetness scale, this semi-dry, semi-sweet cider is super fresh, with incredible apple flavor leading the way from start to finish. Apple Haze weighs in at 5.5% ABV and is available in 4-pack 16oz cans and on draft. It will be available all year round at the Stowe Cider tasting room and throughout Vermont, Massachusetts, New Hampshire, Maine, Connecticut, New York and New Jersey at select stores and bars. Those seeking the haze are encouraged to visit Stowe Cider’s Cider Finder at stowecider.com/findcider.